Here is the link…check it out! I love this place! Great Location! Great Services! Great Staff! Secrets Royal Beach…where the Secrets are both SWEET and ROYAL! Recently had the chance to be at Secrets Royal Beach and fell in love with the resort for so many reasons! The location on Bavaro Beach in Punta Cana is truly magnificent, with the Ocean and Beach being among the best I have seen. The Pool at Secrets Royal Beach is just spectacular! I love the way that it winds around the property giving so many Swim out Suites access and then coming to the Swim Up Bar! LOVELY! And I love all the little bridges that cross over the pool from one side to the other…such a nice feature! While I was there I created a slide show…showing some of reasons I fell in LOVE with Secrets Royal Beach…The Location, The Staff, The Food and Drinks, so many SWEET SECRETS that are both SWEET and ROYAL at Secrets Royal Beach! The Lobby there is both warm and welcoming with lots of great space to spread out and enjoy the lobby bar, or to use the computers to check email or check at the front desk or the two Concierge on either side of the front desk… A friendly vibe about it for sure! There are so many great choices for dining while there at Secrets Royal Beach! Being next door to the “NOW Larimar” opens up to many possiblities! Enjoy grilled specialties in a seaside setting. I look forward to going back again..but til then I keep all the Sweet and Royal Secrets of Secrets Royal Beach in my heart and share them with all for its a Secret too SWEET to be hidden…It must be SHARED and EXPERIENCED to Enjoy Completely! Getting Ready for Aprils AMazing AMResorts Adventure aka The DIVINE DOMINICAN TOUR! Hola and Buenos Dias Todas! I just loaded a video up from last years trip to Secrets Sanctuary Cap Cana and will be loading more from the other resorts I visited as time goes on… as practice so when I am down “doing the Divine Dominican Tour” in April it will be a smooth process! Hope you all will be following Leopardo Laptop and myself as we are on our AMazing AMResorts Adventure in April! We will be Blogging, Tweeting and having FUN and want to share it all with YOU! Kudos to AMResorts for winning 6 Trip Advisor Travelers Awards! Kudos to an AMazing Group of Resorts! I love AMResorts and have visited each of these resorts and agree they are AWARD WINNERS for SURE! AMResorts, provider of sales, marketing and brand management services for Zoëtry Wellness & Spa Resorts, Secrets Resorts & Spas, Dreams Resorts & Spas and Now Resorts & Spas, was honored with six 2011 Travelers’ Choice Awards from leading travel site, TripAdvisor. Travelers’ Choice winners are based on millions of real and unbiased reviews and opinions from travelers around the world. Preferred Hotels & Resorts member, Secrets Maroma Beach Riviera Cancun is located upon one of Mexico’s most beautiful pure white sand beaches offering an exquisite, romantic setting. This adults-only, Unlimited-Luxury® resort treats guests to elegantly appointed rooms and suites with 24-hour concierge and room service, multiple gourmet restaurants and lounges serving premium beverages, endless day and evening activities, and a Secrets Spa by Pevonia. Perfectly located along a 200 yard stretch of private beach on the easternmost coast of the Dominican Republic in Uvero Alto, Zoëtry Agua Punta Cana is a sanctuary of supreme relaxation integrated with nature. This resort offers Endless Privileges® which provide guests limitless access to the majority of all services and amenities that include 51 ultra-luxurious suites, three gourmet à la carte restaurants, two bars and lounges, and a tranquil spa offering an extensive menu including unique indigenous body treatments. A full-service fitness center, salon and meeting facilities are also available to guests at this Preferred Boutique resort. Located on the most ideal piece of land on Mexico’s Pacific Coast, this resort was designed to provide guests with stunning sunset views unlike any other property in the area. A proud member of Preferred Boutique, Zoëtry Casa del Mar is a 42-suite hacienda-style, beachfront boutique hotel featuring Endless Privileges® with exceptionally large oceanfront suites with Jacuzzis, gourmet dining, the world-class Sueños del Mar Spa, multiple tennis courts, and access to the championship 18-hole Robert Trent Jones Jr. Cabo Real Golf Course. Over 650 establishments were evaluated by TripAdvisor users for the Travelers’ Choice rankings. Honorees were celebrated in 16 categories ranging from best in luxury to best in romance. These awards recognize outstanding service, great value and top quality. Kudos to the TEAMS and a Job Well Done! Wanted to share some fun stuff with you today! A while back I found this lovely lady over on “Ebay” and ordered some cards from her. She is a talented lady who does great work! 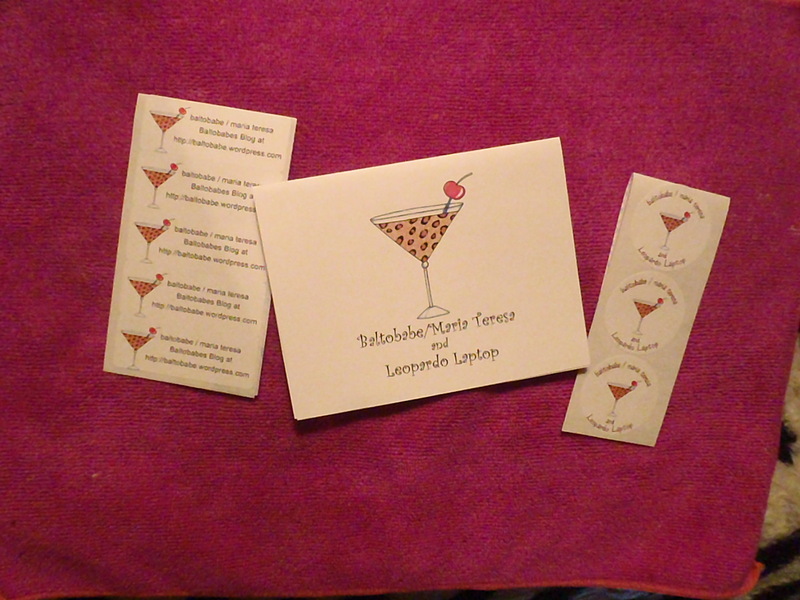 This time I ordered labels too! She makes both the rectangular and round ones too! And check out her blog too! And you can follow her on TWITTER TOO! 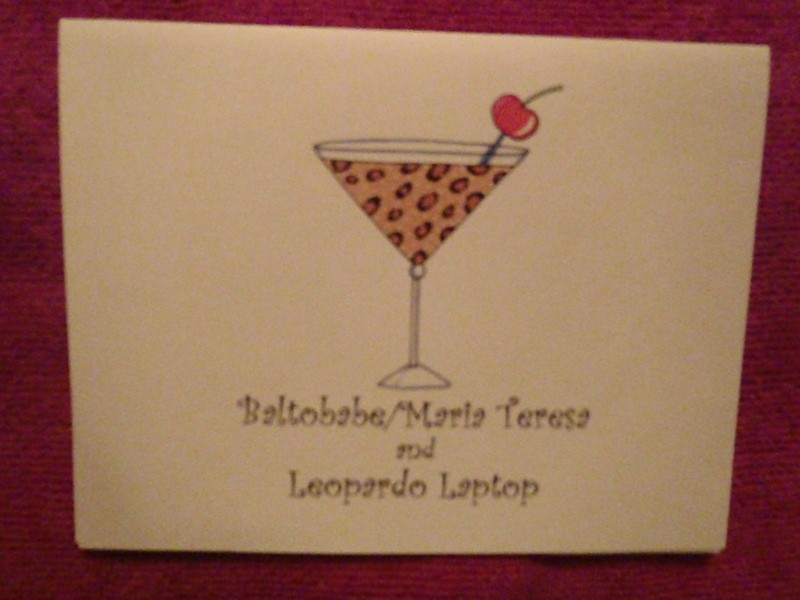 Its such fun when I travel to write a note to folks and “Spread the LOVE and Share the DREAMS” with Leopardo style! Thanks Ms. Robbie for helping me with your great products! Come DREAM with me…some Divine Dominican DREAMS! Hola and Buenos Dias Blog World! Practicing my Spanish…which never really seems to get much better! But I keep trying none the less! Besides the “My Spanish Coach” that I have on my ipod touch now I have “i Start Spanish” anothr app that I got its fun but I still struggle! LOL! Good thing I have mastered the important things like cervaza and bano! Beer and Bathroom, they seem to go hand in hand…LOL! I was thinking about other BLOGS today and thought I would share some fun blogs about the places Leopardo and I will be visiting in April! You’ve heard the song “Soar like an EAGLE”…Speaking of Eagles…some were spotted at Dreams Palm Beach last summer! The Philiadelphia Eagles that is! Recently Danny Bonaduce of TV fame and his new wife spent their honeymoon enjoying SWEET DREAMS at Dreams Palm Beach! Dreams Palm Beach has so much to offer! 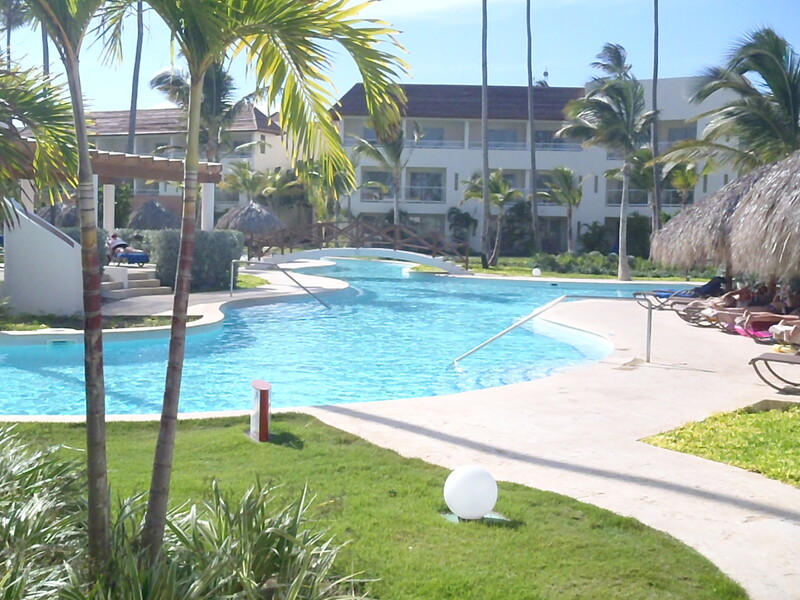 Great Location and Layout and only 20 minutes from the Punta Cana Airport! Leopardo and I love it and think you will too! Down the road a bit from Dreams Palm Beach lies Dreams Punta Cana and there is always something fun going on there! For Kids and Grown ups alike…so make sure to always check your SUNdial Newsletter so you don’t miss out on a thing! If you are bringing little ones to Dreams Punta Cana they will LOVE the “Explorers Club”…it truly is AMazing! Check out what the “DAYDREAMS” Blog said it about it just this past summer! The Pirate Ship is always a big hit! And the Explorers Club Staff is GREAT! At Dreams Punta Cana and all DREAMS Resorts they sure do know how to celebrate the holiday! Heres a bit about how they celebrated the 4th of July last year! They really do celebrate each and every holiday with FUN and know how to Party ON! 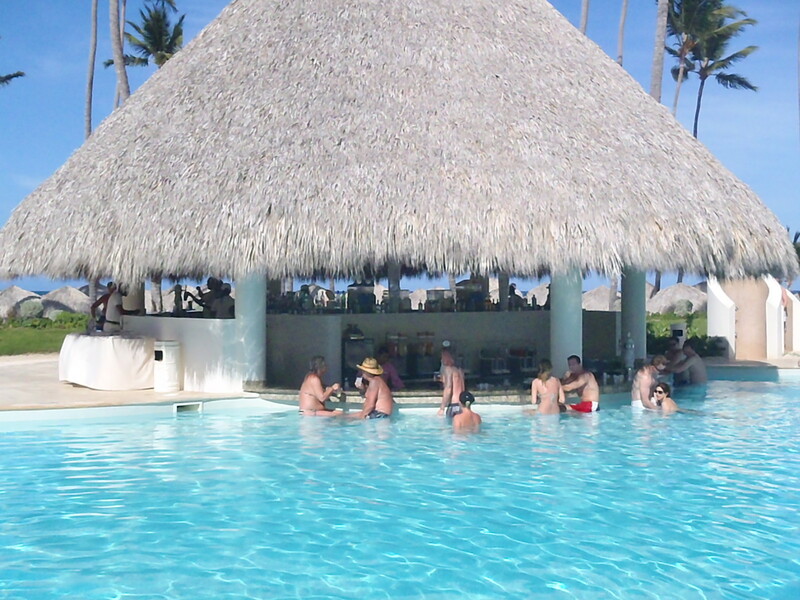 Dreams Punta Cana is about 50 minutes from the Punta Cana Airport and so much fun you won’t want to leave! We love it there and can’t wait to get back! 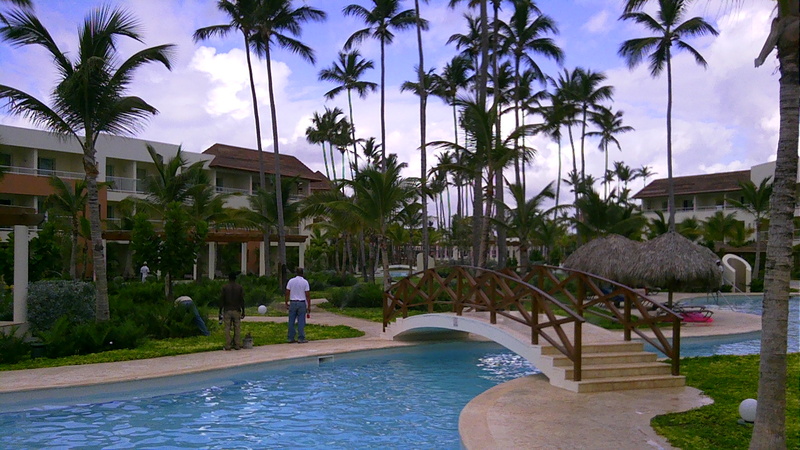 Over on the other side of Punta Cana a mere 90 minute ride from the Punta Cana Airport is Dreams LaRomana! Leopardo and I love Dreams LaRomana along with all of the other Dreams… And it has a very special place in our heart because it was the veryy first AMResorts property that we visited all those years ago when it was SUNscape Casa Del Mar! Here is a FUN blog post about some of the Entertainment you will see there! And another fun blog post about some of the FUN things that you will find in and around the LaRomana area! LaRomana is a different experience than Punta Cana and we love being able to visit all of the DREAMS and find each one speaks to our hearts! The one thing that stands out for leopardo and myself at EACH one of them is their STAFF. They really do everything they can to make DREAMS COME TRUE! Well those are the 3 DREAMS that we will be visiting and we hope that you have enjoyed learning a little bit about each of them! We will be back later to fill you in on some Blog posts about Zoetry Agua and Secrets Sanctuary Cap Cana! Leopardo and I love the anticipation of Count Down…and hope you do to! Spa, such a special word to me! It speaks to my heart and soul! And when I think of the Spas in the Dominican Republic at the Dreams, Secrets and Zoetry Brands I start to float away on a cloud of BLISS! After all you all know I am about “Sharing the DREAMS” and so much more! http://tinyurl.com/6e9kdbv Bliss and Spa Dreams come true @DreamsResorts Palm Beach. Truly Spa-licious a must do while y are there! Oh La La Spa @DreamsResorts LaRomana! Thats what you will say when you visit their Spa http://tinyurl.com/6336d63 let it take you away! @ZoetryResorts Agua, “Where LIFE, ART and ZEN meet to make MAGIC! http://www.zoetryresorts.com/Agua/spa.html and their spa transports YOU! Not sure that the “copied” links will work so will post links here so you can explore the joys of SPA at each the resorts…Just click on the name of the resort and see what “Spa-licous” Treats Await you! They will Transport you on a cloud of BLISS! And take you AWAY for Happy DREAMS, Sweet Secrets and ZEN Moments!